Police say a man has been charged after a dog was found with its muzzle, paws and neck tightly bound with electrical tape. A 32-year-old man, taken into police custody, is charged with wilfully causing unnecessary pain to an animal, Windsor police said. Staff Sgt. Todd said the man charged wasn’t the dog’s owner, but he was trying to retrieve the dog from the Humane Society with two other people & employees there called police immediately. The dog, who has been renamed Justice by the Windsor-Essex County Humane Society, was found lying in the grass Thursday, unable to move. Officials say the dog would likely not have survived more than a few more hours had he not been found. Even after the tape was removed, he was initially unable to stand and his mouth remains swollen. Vets are hoping for Justice to make a full recovery. “Obviously it’s an emotional case, and it affects everybody, especially when you have an animal that’s defenceless like this one. “Detectives worked quickly on it, and fortunately enough, an arrest was made.” A man from Amherstburg, Ontario is charged. A Windsor man was walking his two dogs near the Canadian Tire on Walker Road Thursday when he spotted the small dog lying in the grass, with the dog’s muzzle, paws and neck tightly bound with electrical tape. The dog was unable to move and struggling to breathe with his mouth and paws extremely swollen. The dog was immediately rushed to a veterinarian for care. According to the Humane Society, the dog, now named Justice, would not have survived more than a few hours had he not been found. 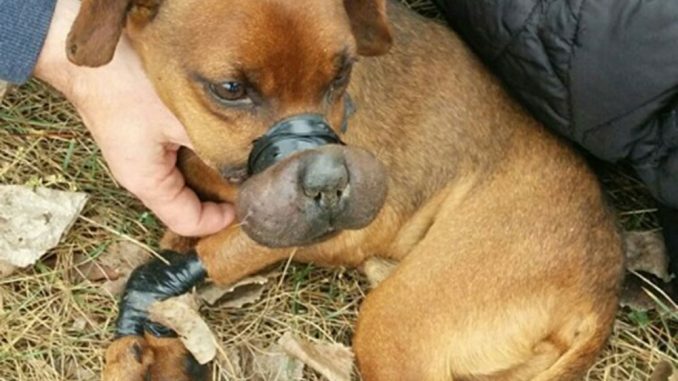 Even when the tape was removed, the dog was unable to stand and his mouth remained swollen. Veterinarians said they found the dog had a pre-existing dental issue. Despite his extreme injuries, caregivers expect Justice to make a full recovery. The dog was immediately rushed to a veterinarian for care. He’s unneutered, estimated to be 7 years old and weighs only 13 pounds.